At one point in time, Claret Punch was an immensely popular concoction. It was the punch of choice for parties and the drink most enjoyed by the British in the 1800’s. Today, if you sauntered into a North American bar and asked for a claret cup, you’d be hard pressed to find a bartender that could make it, let alone one that knows what claret is. It’s too bad because claret cup has a lot of potential and is one of those drinks, like the Caesar (Bloody Mary) that has a basic recipe structure, but beyond that can be modified in so many ways. Claret is a centuries-old British designation for wines from the Bordeaux region in France. However, the use was not exclusively used to describe Bordeaux wines and many red wines were called claret. The term made its way to North America. Eventually, the term faded in North America. The history of how the term “claret” came to be is told in this January 18, 1873 newspaper article from the Daily Evening Bulletin (San Francisco). In the 1800’s everybody had a recipe, with unique additions, that made “the best Claret Cup”. The basic recipe is red wine, lemon, sugar and carbonated water. From there you can add anything you want. Some add spices, bitters, sherry, fruit juices, liqueurs, brandy, champagne, rum, whisky, etc. Borage is a common garnish and if you don’t have that cucumber will do. Claret Cup has a significant resemblance to Sangria and is probably the English equivalent. Some may even recognize a striking resemblance to a Pimm’s Cup. 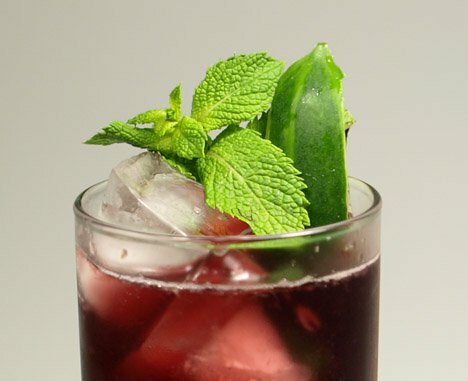 I’m of the opinion that the Pimm’s Cup is just a modification of the Claret Cup, using sweet vermouth instead of Bordeaux. Obviously, documentation is lacking, but it wouldn’t take much to switch out claret with sweet vermouth and call it something new. As for glassware, the classic punch glass is probably traditional. However, times change and I’m not a big fan of the punch glass. For my Claret Cup, I’m going to take a cue from the Pimm’s Cup and use a highball glass. 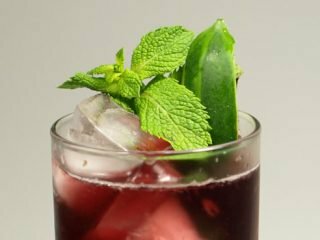 An old-fashioned punch style drink made with red wine and a variety of liqueurs. It has many variations and is a great drink for summer sipping. Combine all ingredients, except club soda, in a shaker tin with ice. Stir until well chilled and strain into a highball glass with fresh ice. Garnish with cucumber, mint and optionally strawberries, blueberries or other fruit. Variation is the key to this cup. Extravagant garnishes are a fun way to make this a crowd pleaser. Now, if you wanted to do the ultimate claret cup garnish you could use the petals of the claret cup cactus. The flowers of this cactus are edible and so is the highly prized fruit the cactus produces. To make claret cup most red wines will do. But Bordeaux styles are traditional. Obviously French will do, but you can also look at new world wines. I went with a local (Niagara region) wine, which just happens to have the same climate as Bordeaux. Many Niagara region wines are styled after Bordeaux and use the same grape varieties. I selected Rief Estates Cabernet Merlot. You can use a bold Australian red, but you may want to cut back on the amount and up the other components, otherwise, the wine will dominate the drink. Add the rind of a cucumber, orange slices, pineapple, assorted berries and mint. For a similar cocktail, take a look at the Pimm’s Cup, Planter’s Punch or maybe a Moral Suasion.